Democracia y desarrollo: un enfoque "partidista"
Translated by Lucía Tiscornia y Mateo Porciúncula. Translation from Revista Uruguaya de Ciência Política, Montevideo, v.17 n.1. For years scholars have tried to find the magic key to Latin American development, mainly through economic theory and economic institutions. In this paper we propose a different approach: we claim that in the long run, the rotation in government of right and left-wing parties favors development. We assume that development combines growth and increased social well-being, that right-wing parties prioritize growth while left-wing parties prioritize social well being, and that there is a trade off between growth and income distribution in the long run. This hypothesis is tested empirically using a simple of 122 countries, using the United Nations' Human Development Index (HDI) as a proxy for development. Durante muchos años los estudiosos han procurado encontrar la clave mágica del desarrollo latinoamericano en el plano de las ideas económicas y en las instituciones económicas. En este artículo se presenta un enfoque diferente. Se propone que, en el largo plazo, la rotación de partidos de izquierda y partidos de derecha es el escenario que más favorece el desarrollo de las naciones. Se asume que el desarrollo es un proceso que combina crecimiento y aumento del bienestar social, que los partidos de derecha priorizan el crecimiento y que los partidos de izquierda enfatizan la redistribución del ingreso, y que existe en el largo plazo un trade off entre crecimiento y distribución del ingreso. Esta hipótesis es sometida a un análisis estadístico con una muestra de 122 países, usando el IDH calculado por Naciones Unidas como Proxy de desarrollo. For years Latin Americans have tried to find the magic key to economic development and social well being, focusing in economic theory and institutions. In the last five decades, developmentalists', dependentists', neo-classics' and neo-institutionalists', each from their own corner, have claimed that Latin Americans would only make economic and social progress once they discover and apply the real' paradigm (Garcé 2000). Recently, some Latin American scholars have started to challenge the conventional approach and began to accept the existence of alternative development paths. For example, José Antonio Ocampo claimed that "the idea that there should be a pattern, style or unique model of development applicable to all countries, is not only ahistoric, but also harmful and contrary to democracy" (Ocampo 2005, our translation). In this paper we argue that it is necessary to take another step in that direction. We agree with Ocampo in that "democracy is diversity", and that there could be "alternative paths towards development". We understand that there are good theoretical reasons and empirical evidence to argue that development is facilitated when countries manage to oscillate between different models of development that could otherwise be seen as contradictory. More specifically, we claim that in the long-run, the most favorable scenario to increase the well being of the majority of population is the rotation in power of left and right-wing parties. The logic of our argument is structured around three elements. First, we make a distinction between the concepts of economic growth and development1. We understand development as a process of sustained economic growth that is accompanied by income redistribution. This approach has gained influence in the economic thought with Amartya Sen, but has deep roots in modern economic theory (from John Keynes to Gunnar Myrdal) and in the Latin American structuralist' thought (from Celso Furtado and Raúl Prebisch to ECLAC's [Economic Commission for Latin America and the Caribbean] demands for a 'productive transformation with equity' in the nineties)2. Second, in line with the scholars that understand that a distinction between left and right is both possible and necessary (Bergman et al 1994; Bobbio 1995; Boix 1996; Budge et al 2001; Alcántara 2004), we assume that left-wing parties prioritize income distribution while right-wing parties prioritize the search for economic growth. We do not think that this distinction is excessively arbitrary. On the contrary, it is relatively extended among politicians, academics and the public opinion. Third, we assume that in the medium run there is a trade off between growth and equality. When holding political power, political parties can maximize both objectives simultaneously, but only for relatively limited periods of time. In this case, we join the classic economic view that after a certain threshold, increasing equality can deter economic growth3. This does not mean that we discard the results obtained by Persson and Tabellini (1994), according to which high levels of inequality deter economic growth. Considering that we will not formulate a model of electoral behavior, we will explain the political economics of this trade off. Many years of left-wing governments strengthen the social protection mechanisms and the level of salaries. This conspires against savings, investment and competitiveness. This slows growth and eventually affects personal incomes, the level of employment, tax collections and the quality of public services. Eventually, popular discontent means that voters opt for a right-wing party that offers a set of policies targeted at relaunching the economy. Analogously, many years of right-wing governments stimulate economic liberalism and weaken income redistribution and government intervention to guarantee access to certain levels of education, health and social protection. This increases the potential impact on development that can be derived from the implementation of social redistributive policies associated with the left. This logic is formalized in the next section. This argument intends to contribute to the understanding of the relationship between democracy and development. These two factors are positively related (see for example Przeworski, Alvarez, Cheibub and Limongi 2000), though the debates about the orders of causality are still open, fed by the different results arrived at by different methodologies and data sets. One of the approaches to explain the link between democracy and development comes from institutional economics, according to which the rules of the economic game' are more likely to be changed abruptly in a non-democratic country than in a democratic country, given the complex system of checks and balances that characterizes the latter. This reduces economic uncertainty, attracting investment and favoring economic growth. Here, we will avoid the institutional approach and defend the partisan' approach. According to the definition above, the concept of development goes beyond economic growth and refers to a generalized enhancement of well being. This implies not only an increase in the resources available to the population (growth), but also an increase in the number of people who receive them (distribution). In this sense, growth and distribution are two necessary conditions for development. In the long-run, the continuity of economic policies centered around only one of those aspects would weaken its effect on development and increase the need for the other. This idea can be formalized as follows. Suppose that we have a measure of the level of development (D), which depends positively on both the economy's level of income per capita (P) and the equality of the distribution of resources (T). Let us also assume that the functional relationship is Cobb-Douglas, as shown in expression (1), where 0 < α < 1. That is, the marginal effects of each of these factors on development are positive but decreasing. Expression (2) shows that the effect of income on development depends positively on the level of distribution but negatively on income itself: this means that the greater the income relative to equality, the smaller the marginal impact of income on development. Analogously, greater levels of equality mean greater impacts of income on development. Expression (3) shows the counterpart: the effect of equality on development (represented by the first derivative of development with respect to equality) will be greater in countries with greater levels of income and lower levels of equality, and will be lower in countries with lower income and higher equality. Like in the classic economic theory, more abundance of a resource means that the other is more productive. In this case, a society that only promotes growth without redistribution will empty' the effect of growth on development and will only be able to make an impact on development through redistributive policies. This reflects the idea that a government can be successful in the short run promoting one of these components of development or the other, but in the long run, a successful development experience depends on the ability to switch from a growth strategy towards a redistributive strategy, and vice versa. In other words, the ability to switch from one set of policies to the other allows for a sustainable and equilibrated development in the long run. According to the objectives of right and left-wing parties mentioned above, the probability of alternating growth and redistributive policies increase if right and left-wing parties alternate in power. Naturally, this requires a democratic political system that allows for party rotation, and in which the growth of the opposition does not to lead to an end of democracy. In this way, democracy allows for party rotation, which in turn favors the application of the set of policies required to promote development in the long run. Our hypothesis is that this could be one of the reasons why democracy and development are positively correlated: democracy is the means' through which right and left can alternate in power, assuring (or increasing the probability) that growth promoting policies and distributive policies alternate in the long run, favoring development. In this section we test our previous assertions empirically. With a sample of 122 countries, we proxy for development using the United Nation's Human Development Index (HDI).4 This index aggregates income per capita with two measures of social well-being (health and education). Though comprehensive definitions of development comprise various dimensions not included in this measure (i.e. gender equality), we understand that this proxy has at least three virtues: first, this is a standardized index for various countries, which has been widely used by several researchers. Second, it fits very well with the two dimensions of development that we are focused on (growth and development). The HDI does not measure income distribution directly, but it incorporates two measures of the social reach of that income (in health and education). In other terms, we understand that a country that manages to grow and improve the education and health levels of its population, is a country that is managing to spread socially the benefits of that growth. Third, part of our task here is to capture the effect of redistribution on development. However, redistributive policies go beyond income redistribution: left-wing parties also implement redistribution by taxing income and channeling the proceedings to education and health; this kind of redistribution does not qualify as income redistribution. Therefore, the effect of those policies could be seen more clearly observing the health and education indexes of HDI rather than through for example the Gini index of income distribution. For these reasons, we understand that our choice of variable is correct and we expect other measures of distribution (i.e. Gini) to be correlated with the distributive dimension of the HDI. Figure 1 shows the relationship between the Gini index of income distribution and the health and education components of the HDI for a set of 126 countries in 2006. The figure produces the expected result of a reasonable (though not perfect) correlation between the health and education measures of the HDI and income distribution, suggesting that taking the health and education parts of the HDI as a proxy for distribution is a sensible option, while it allows us to benefit from the advantages mentioned above. 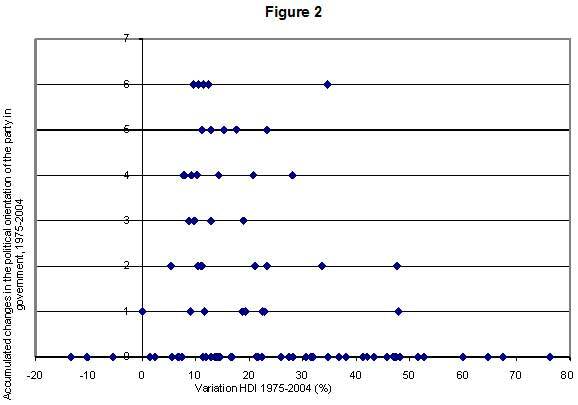 The HDI only has comparable values (obtained with the same methodology) for the years 1975, 1980, 1985, 1990, 1995, 2000 and 2004. The resulting short and discontinuous data available complicates a time series approach. For practical reasons, our proxy for the ideological orientation of the government is the ideological orientation of the party in government, regardless of whether it governs alone or in a coalition. To track the switches from left to right and vice versa, we use the Database of Political Institutions (World Bank). This database classifies the political ideology of the party in government for each year between 1975 and 2004 for a cross section of countries. The categories used in the database are left, center, right, not applicable (for the cases that do not fit the previous categories), and without party (when an executive power is nonexistent). We compute the number of times that a country changed between right, left or center in the period 1975-2004, and we call this counter accumulated changes'. To measure democracy we use a standard variable: the Polity variable from the Polity IV database5 . This variable attributes values to the political systems of a large set of countries for a long period of time, where the values range between -10 (totally non-democratic) and 10 (totally democratic). Here we add ten points to this variable just to facilitate the interpretation of the coefficients: with Democracy' we refer to the value of the Polity variable plus ten points. In table 1 this variable appears averaged over 1975-2004. We use two control variables: the 1975-2004 average of public expenditure as a share of GDP6 and gross fixed capital formation as a share of GDP7 . According to our initial hypothesis, the history of the switches between left and right governments should provide information on the level of development observed in 2004. Table 1 presents different regression models where the dependent variable is the level of HDI in 2004 (see the appendix for some considerations regarding the data and the choice of methodology). In the six specifications of table 1, we use Initial HDI' as an explanatory variable. With this we refer to the HDI in 1975 or the first year with available data afterwards. From the 122 countries of the sample, 94 have HDI data for 1975, 10 have data for 1980 (the immediate observation after 1975), and all the countries have an observation for 1990, so the Initial HDI' never refers to values after 1990. In all six specifications the initial HDI level is positively related with the final HDI level (HDI level for year 2004), and is highly significant (1% level). This was an expected result: countries that were highly developed' in 1975 are still in that category in 2004. This path dependency suggests that including the initial HDI level could be a good way to account for all the idiosyncratic or slow changing factors that may be influencing the level of development of a country (colonial history, culture, climate, etc). Given its absolute value, this is the variable with the strongest economic significance of the regressions presented in table 1, and the one that more heavily determines the dependent variable. Its coefficient of between 1.13159 and 1.14897 indicates that leaving everything else constant, on average there was an increase in HDI of between 13 and 15% in the observed period. The Squared Initial HDI' variable tries to capture the changes of the rate of growth of HDI as it evolves over time (something like the second derivative of the development curve). A negative sign for this variable means that countries with a higher initial HDI grew on average less than those with a lower initial HDI level, giving place to a conditional convergence process. Though this variable appears with the expected negative sign, it is not significant at 10% level in any of the six models. The coefficient for Public expenditure as a share of GDP is significant at 1% in the six models, and has the expected negative sign. 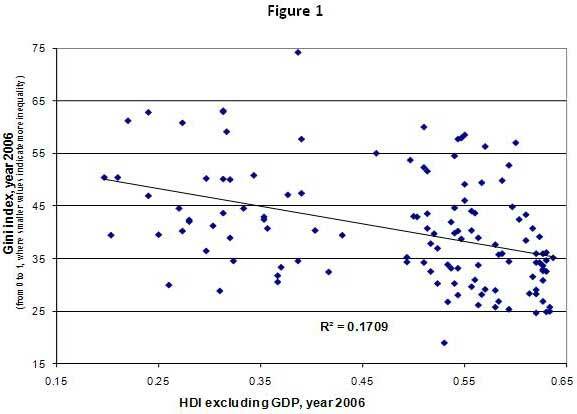 This means that on average, countries that spend more relative to GDP tend to have a lower HDI. The gross fixed capital formation as a share of GDP is significant at 5% in all the models and has the expected positive sign, so investment seems to affect development positively. The introduction of the controls prevent us from observing certain kinds of spurious relationships between switches in the ideology of the political party and the HDI: for example, we know that the relationship between party switches and HDI is not due to different expenditure preferences or attitudes towards investment. The variable accumulated changes' also has the expected positive sign and is significant at 10% in two of the models where it appears. This suggests that the countries with a greater HDI in 2004 had more changes in the political orientation of the party in power, which goes in line with our initial hypothesis. The variable democracy' appears in three models, in all of which it has a negative and highly insignificant coefficient. This suggests that democracy per se has no significant effect on development. The introduction of the interaction term in the third model renders accumulated changes' and democracy' insignificant at 10%. According to Brambor, Clark and Golder (2006), this means that we can exclude one of the components of the interaction term. This is what we do in models 4 and 5, while in model 6 we eliminate both components of the interaction term. In that last model, the positive and significant (at 10%) coefficient of the interaction term suggests that the accumulated changes have a greater impact on the HDI when countries are more democratic. That is to say, the effect on development of party orientation rotation is greater when there is more democracy. Therefore, though democracy per se appears to have no significant effect on development, it may be operating as a vehicle for other factors (in this case, for the rotation of the political orientation of the party in power). This has an interesting theoretical interpretation: only if the democratic system works satisfactorily we can talk about left and right-wing parties that act as agents competing for political power, offering alternative sets of policies that can promote development. If democracy is not working properly, the differences between the political options get blurred, and the policies applied could respond to specific interests of the groups in power rather than to left or right-wing policies as we understand them here. Following Akaike and Schwarz information criteria as well as the adjusted R squared, the most appropriate specifications of table 1 seem to be models 1 and 6. In both cases, the accumulated changes have a positive and significant effect on the HDI, which means that we cannot reject our initial hypothesis. It is possible to argue that the interaction of left and right could generate uncertainties regarding the future, which, in turn, could affect development. In fact, some scholars found that a high frequency in the change of the party in government can worsen the budget deficit and inflation (Grilli, Masciandaro and Tabellini 1991; Calcagno and Escaleras 2006). In our case, the data suggest that this has not operated. Figure 2 shows that the countries with a greater variability in the rate of change of the HDI are the countries with less changes in the orientation of the political parties. In other words, the countries that have changed the orientation of the political party in power more times, have less uncertainties about the rate of change of the HDI. This yields the pyramidal shape of figure 2. This suggests that in an established democratic system, changes in the orientation of the governing political party do not generate uncertainties that affect development. As long as individual rights and private property are respected (central pillars of modern democracy), development can be achieved with a political party of any sign in power. In turn, the concentration of power and the lack of serious alternatives could difficult the ability to adapt to new scenarios, which may bring uncertainties that could damage the prospects of development. If the voters have no real political alternatives (or if the party in government is not accountable to anyone), then those in power have a level of discretion that generates risks and uncertainties. Summarizing, the rotation of parties in power seems to have a positive effect in the long run in terms of development, rather than a negative effect through uncertainty. To test for possible short-run effects, we re-ran models (1) to (4) from table 1 for the period 1975-1990. The results show that none of the variables related to accumulated changes are significant to explain the level of development. This can be due to at least two factors: (i) political parties have changed substantially in the last two decades, so that rotation in power in 1975-2004 had a different impact on development than rotation in the period 1975-1990; (ii) the period 1975-1990 is too short to capture changes in development resulting from rotations of the party in power. We prefer the second kind of explanation, for at least two reasons. First, the criteria used by the creators of the database to decide whether a party is from the left, center or right, was the same for all the years involved. Second, most of the democratic government periods covered in the database last between 4 to 6 years. For this reason, in order to observe enough accumulated changes (which is the crucial variable of our analysis) we need a relatively long period of time. Observing this accumulation for a period of 15 years (as in between 1975 to 1990) does not allow for a great discrimination between countries with high and low rotation of parties in power (over 15 years there are on average 3 government periods in a typical democratic country), while some discrimination appears to be possible for the period of 29 years elapsed between 1975 and 2004. A longer period means that there are more government periods, which allows for party rotation. This is consistent with our initial hypothesis that the effect of party rotation is observable in the long run. Additionally, this highlights the impossibility to work with a time-series approach: the effects seem to occur over periods of time that are too long to be captured in periods shorter than the longest series available (which is 1975-2004). In our sample, the average initial HDI of the countries with zero accumulated changes in 1975-2004 is 0.536. According to model 1, this means that if the average country of this group had 5 changes in the orientation of the party in power (and assuming other factors are constant), the final HDI would have reached 0.572, which represents an increase of approximately 6.8% over the initial level. However, considering that the other factors did not remain constant, the HDI of this group reached in 2004 an average of 0.637 points, which represents an increase of 18.8% over the initial level. This means that 5 changes in the ideological orientation of the party in government would have generated an additional increase in HDI of over a third of the increase effectively observed through the direct' factors (income, education and health). In the extreme, if a country accumulated 8 changes during the period (a change every 4 years on average), according to model 1 the HDI would have increased by 10.8% (leaving other factors constant). This is almost three fifths of the increase effectively observed in this group (the group of countries with zero accumulated changes in the period). This highlights the importance of this factor: to reach an increase of 10.8% in the HDI through increases in GDP, a country of this group would have needed to increase their GDP by 1% (cumulative) during the observed period. Model 6 shows the effect on development of variations in the number of accumulated changes and in the level of democracy. The average level of democracy during the observed period was 8.27 for the countries without party orientation changes (remember that the index of democracy used here ranges from 0 to 20, where 20 is maximum democracy). Incorporating the effect of democracy changes the perspective of the previous analysis: according to model 6, if the average level of democracy remains unchanged in 8.27 for next 30 years, then 8 changes in the political orientation of the party in power would increase the HDI by 4.8%. This is not negligible (on average, a country of this group needs to increase its GDP by 0.5% cumulative during 30 years to reach this increase in the HDI), though it is far from the effects obtained from model 1 (where democracy was not considered). However, if democracy reaches its maximum value of 20 points, then 8 accumulated changes would produce an average increase of the HDI of approximately 11.7%, which is above the results obtained with model 1. Therefore, the results presented here show that the coefficients obtained are statistically and economically significant, meaning that we have enough evidence to conclude that the rotation of the ideological sign of the party in power has a relevant effect on long-run development. How can these results contribute to the analysis of the left turn' recently observed in Latin America? We can be tempted to say that the rotation to the left will be beneficial for development in the long run. However, we cannot forget the institutional prerequisite discussed above: for party orientation rotation to have a positive impact on development in the long run, the political parties have to compete in a healthy democratic system. This contains the double responsibility faced by the Latin American left: they need to introduce their left-wing policies but also they need to improve the democratic system. Particularly, the risk is that if the left does not satisfy the voters' demands, the legitimacy of the democratic system (as a tool to find political alternatives) could be weakened. In other words, there is a feedback between the two levels of responsibility identified here: failures at the substantial level (the introduction of left-wing policies), weaken the formal level (democracy). Of course, this feedback also amplifies the positive effects: better results in the policies could reinforce democracy, thus allowing for a greater effect of party rotation in the future. In this way, the new arrival of the left to Latin America comes with risks and opportunities at the same time. The partisan approach to development implies that the best scenario for Latin American development is that the current wave' of left-wing triumphs will be followed by a counter-wave' of right-wing triumphs. It is not the left what will take Latin America out of underdevelopment. Neither is the right. If our hypothesis is correct, it is the rotation in both in a well-functioning democratic system. We tested the hypothesis of whether the rotation of the political orientation of the party in power affects development in the long run. We identified three requirements for this to happen. First, rotation has to be possible, which requires a well-functioning democratic system. This was explicit in our sixth regression, which shows how more democracy increases the long-run effect on development of additional changes in the political orientation of the party in power. Second, the set of policies offered by left and right-wing parties have to match the definition that we used here (left parties prioritize distribution, right parties prioritize growth). Third, political parties need to have relatively stable ideological positions, so that left-wing parties do not easily adopt right-wing-style policies (and vice versa). Of course, there are examples of political parties that, once in government, implement policies that are contrary to what their ideological orientation suggests8. However, we see those as exceptional cases. Also, we understand that, at least theoretically, the political dynamics could force the parties not to deviate excessively from their historical positions (Klingermann, Hofferbert and Budge 1994, pp. 23-24). The three conditions mentioned above are essentially political. Development requires democracy and parties to hold preferences which are stable and different in terms of development strategies. From this point of view, the challenges of development are not in the field of economic ideology, but about how to build solid democratic institutions, party systems, and citizens that are capable of exercising their political rights. According to Sen's formulation, societies develop as long as its individuals can better exert their ability to choose: "the expansion of freedom is as much the main end of development as it is its main mean" (Sen 1999, p 16, our translation). This paper, through another way, agrees on that: development requires that citizens can opt freely, once and again, among significantly different political alternatives. Finally, the lack of data does not allow us to test our hypothesis using a time series approach, which would allow to check for causalities in the relationship discussed here. Building those time series either requires longer HDI series than what is currently available, or another reliable proxy for development with longer time series. This is a task for future research. As the HDI ranges from 0 to 1, countries with lower initial values can potentially see their HDI grow more than the rest, which creates conditional convergence. This does not mean that the HDI qualifies as a censored dependent variable, because data are available for all the countries, and there are not unobservable ranges of data. However, we understand that the HDI is the most complete available indicator of development for a wide set of countries. Some scholars have used GDP as a proxy for development. We have explicitly discarded this variable because we want to account somehow for redistributive aspects. Additionally, in this sample and according to our models, the simulation of the dependent variable from the estimated coefficients always yields values between 0 and 1. As we mentioned above, the United Nations only publish comparable values of the HDI (obtained with the same methodology) for the years 1975, 1980, 1985, 1990, 1995, 2000 and 2004. The resulting short and discontinuous data available complicates a time series approach, which would be needed to test our hypothesis more robustly. Alcántara, Manuel. 2004. ¿Instituciones o máquinas ideológicas? Origen, programa y organización de los partidos latinoamericano. ICPS: Barcelona. Bielschowsky, Ricardo. 1998. Cincuenta años del pensamiento de la CEPAL: una reseña. Cincuenta años de pensamiento en la CEPAL, Vol. I, Santiago de Chile: CEPAL. Bielschowsky, Ricardo. 2000. Pensamento Econômico Brasileiro. O ciclo ideológico de desenvovimentismo. Rio de Janeiro: Contraponto. Bobbio, Norberto. 1995. Derecha e izquierda. Razones y significados de una distinción política. Madrid: Taurus. Boix, Carles. 1996. Partidos políticos, crecimiento e igualdad. Estrategias económicas conservadoras y socialdemócratas en la economía mundial. Madrid: Alianza Universidad. Brambor, Thomas; William R. Clark and Golder, Matt. 2006. Understanding Interaction Models: Improving Empirical Analyses. Political Analysis 14(1), pp 63-82. Budge, Ian; Klingemann, Hans; Volkens, Andrea; Bara, Judith and Tanenbaum, Eric. 2001. Mapping Policy Preferences. Oxford and New York: Oxford University Press. Bergman, Torbjorn; Budge, Ian; Hofferbert , Richard; Keman, Hans; Klingemann, Hans; Pétry, François and Strom, Kaare. 1994. Parties, Policies and Democracy. Boulder, Colorado: Westview Press. Przeworski, Adam; Alvarez, Michael; Cheibub, José Antonio; Limongi, Fernando. 2000. Democracy and Development: Political Institutions and Well-Being in the World (1950-1990. Cambridge: Cambridge University Press. Rodríguez, Octavio. 2006. El estructuralismo latinoamericano. Santiago de Chile: CEPAL. Sen, Amartya. 1988. The Concept of Development. In H. Chenery and T.N. Srinivasan (eds.) Handbook of Development Economics, Vol. 1, Amsterdam: Elsevier Science Publishers. Sunkel, Osvaldo and Paz, Pedro. 1973. El subdesarrollo latinoamericano y la teoría del desarrollo. Mexico: Siglo XXI. 1 For the rise and evolution of the concept of development in economic theory see Sen (1988, pp 10-26) and Sunkel and Paz (1973, pp 17-22). 2 For ECLAC's thought, see Bielschowsky (1998; 2000) and Rodríguez (2006). 3 For a recent debate on development, income distribution and institutions, see Álvarez, Bértola and Porcile (2007, pp 17-27). 5 From University of Maryland's Center for International Development and Conflict Management and George Mason University's Center for Global Policy. 6 Source: Alan Heston, Robert Summers and Bettina Aten; Penn World Table Version 6.2; Center for International Comparison of Production, Incomes and Prices at the University of Pennsylvania, September 2006. 7 Source: World Bank, World Development Indicators (WDI) April 2008, ESDS International, (Mimas) University of Manchester. 8 The case of the peronistas' during the first presidential term of Carlos Menem in Argentina (1989-1995), is the best Latin American example of a large-scale mutation in political preferences. In that case, there was a major shift from nationalist and statist set of policies, towards neo-liberalism.